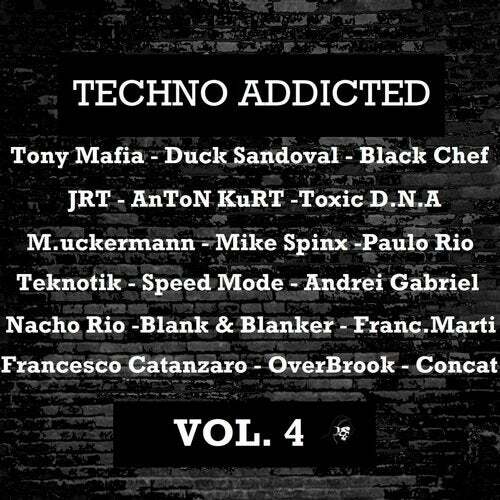 For this time we present you this massive compilation of VARIOUS ARTISTS titled "TECHNO ADDICTED VOL. 4". Including 32 Original Tracks & Remixes by exclusive Artists as Tony Mafia - Duck Sandoval - Black Chef - JRT - AnToN KuRT - Toxic D.N.A - Teknotik - Speed Mode - Andrei Gabriel - Concat - M.uckermann - Mike Spinx - Blank & Blanker - OverBrook - Paulo Rio - Nacho Rio - Franc.Marti - Francesco Catanzaro. TECHNO ADDICTS RECORDS 2019. Copyright All Rights Reserved.